We continue our 2016 Giller Prize coverage this week—generously sponsored by Publishing@SFU—by checking in with finalist Catherine Leroux. 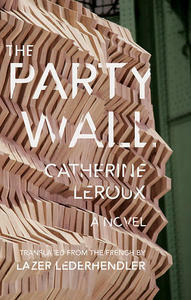 Leroux’s novel The Party Wall brims with exquisite storytelling. She weaves four distinct storylines into a complex work that questions what we believe about our emotional and physical memories. Catherine Leroux was born in 1979 in the northern suburbs of Montreal. 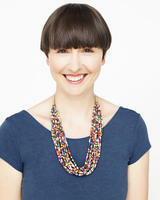 After holding various jobs she became a journalist and devoted herself to writing. Her first novel, Marche en forêt, was published in 2011 by Éditions Alto, and her newest novel is Madame Victoria (Éditions Alto, 2015). The Party Wall, her English-language debut published with Biblioasis in 2016, was selected for Indies Introduce for Summer/Fall 2016. How was The Party Wall born? It started with a news story I heard on the radio in 2005, which eventually became Ariel and Marie’s story. It was so romantic and odd, almost tragic—I immediately thought that it would make a great novel. Simon and Carmen’s characters quickly formed in my mind as a sort of counterpoint to Ariel and Marie. But at the time, I wasn’t sure if I had it in me to write an entire novel so I waited. Around 2010, I heard Karen Kegan’s story in a podcast, and I sort of put it in the same box where I had stored the others. That would become Madeleine’s story. Then, the year after, I heard about the little girls in the American South. That’s when I started to understand how all these tales were linked, and how they could work together in a novel. Your novel deftly weaves together four very different sets of relationship pairs—two young sisters, a mother and son, a political couple in an apocalyptic future, and a brother and sister searching for their father. It’s an unusual and bold structure and you pull it off brilliantly. What particular challenges did you encounter writing the book? The challenges were different for each plot. Madeleine is the closest character to a real person, and I had trouble making her my own. She was very flat and boring at first, because I didn’t want to make her “bad.” I had to work hard to give her some flaws, tics, texture. Ariel and Marie evolve in the future, and painting a world that was interesting, new, surprising, and coherent was a challenge. Then, of course, there was the issue of tying everything together as seamlessly as possible, while avoiding anachronisms, inconsistencies, and finding a way to unify the tone of four very different plots. I used a lot of graphs and charts! This is the second year in a row that an English translation of a French title has landed on the Giller shortlist. Why is it important for English Canadians to read the translated work of French Canadian writers? How can this be encouraged? I believe that art and fiction are the best channels to improve understanding and solidarity between the proverbial two solitudes. Publishers such as Biblioasis, Talon Books, Coach House, and House of Anansi are doing a great job putting some of these novels out there. The rest of the “book chain”—readers, bloggers, critics—and those of us who are lucky enough to be able to read in both languages have a responsibility to talk about what they read—and it goes both ways (English to French, French to English). Publishers such as Biblioasis, Talon Books, Coach House, and House of Anansi are doing a great job putting some of these novels out there. I’d like to be asked how I came up with Edouard’s character. That would allow me to talk about my years as a hitchhiker, which I really like to brag about. I’d also tell them about a photo series called La Vida de Vagabundos Americanos, and about a blog written under the pseudonym Crachapelle. It was the chronicle of the young woman’s travels in the US, hitching rides and train hopping, and sleeping under bridges. I loved the grits and rhythm of her writing, and along with the photo series, it became a huge inspiration for Edouard’s universe of drifters and vagabonds. The blog has unfortunately disappeared. I wish I could go back to it. 49thShelf is built around a large community of readers and fans who love great CanLit. What Canadian authors are you reading these days? Any recommendations? Thanks to the Kingston Writers Fest, I am discovering the powerful poetry of Laurie D. Graham. I’m ashamed to admit how little I knew of English Canadian poetry, and this is a great way to dive in. I am also reading Madeleine Thien’s Do Not Say We Have Nothing and I am enchanted. Her prose is magnificent, every word she writes oozes with humanity and love for her characters, which is something I appreciate beyond anything else. I’m currently translating Mark Frutkin’s beautiful novel Fabrizio’s Return, which came out ten years ago and will soon be discovered by the French public, to my delight. It goes to show it’s never too late for a great book to make its way to new readers! The animal chews tamely on the proffered snack, then Angie lifts up Monette so she can stroke—ever so lightly—its peeled muzzle, its scrawny croup, its ragged coat. From the back of the pink shed, a man wearing a flawless moustache appears and, beaming with pride, greets them. Old Craig is fond of his filly.